HOW IT WORKS — LOOK AT ART. GET PAID. We completed our pilot at the RISD Museum in Providence, RI in November 2016. Though we’re making changes for future iterations of LAAGP, our pilot process conveys the general arc of the project. Learn more about our upcoming plans here. 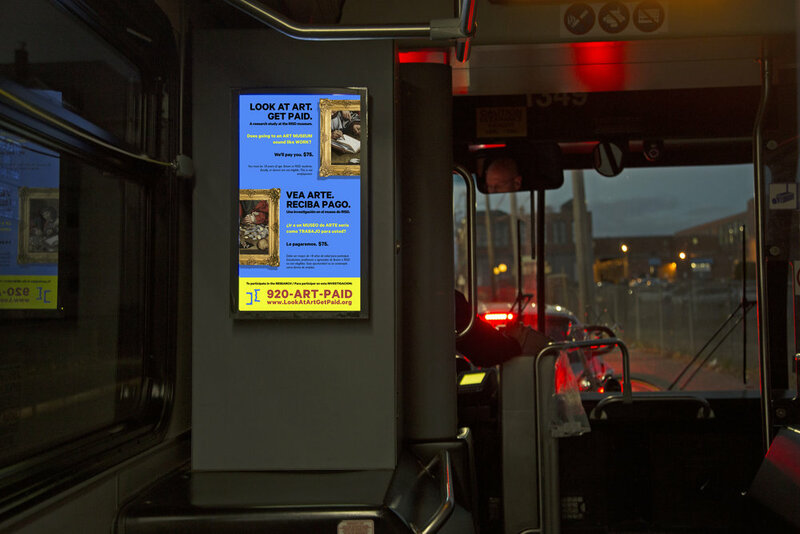 We posted an advertisement in Rhode Island's public buses. We received over 200 inquiries and narrowed it down to 41 participants, prioritizing people who had never been to a museum and people of color. We used the common and legible format of a research study to reach the public. We conducted 30 minute phone interviews with participants and invited them to the museum. Phone interviews focused on the participants' existing cultural engagements and their relationship to art and museums. We also used this time to clarify our position and intentions—we were not employees of the museum and wanted to hear honest opinions. We provided snacks and refreshments upon arrival. We assigned participants the role of the guest critic, a title that typically refers to visiting experts paid to critique art in an academic setting. Our handbook offered ways to structure the visit and permission to interpret. Download the handbook here. Guest critics had 2 hours to explore the museum's galleries. We encouraged guest critics to pay attention to their senses: sight, sound, smell, and touch. They observed the art, architecture, social codes, visitors, staff, security, signage, and more. Some guest critics took notes. We provided note paper and optional written activities, inviting the guest critics to re-write a museum label and draw a blind contour of an artwork. After two hours exploring the galleries, the critics participated in a group critique. We facilitated a one-hour open conversation about the museum—its art collection, space, protocol, and relationship to the public. Guest critics were paid $75 in cash at the end of their visit. They were paid $15 an hour—above living wage in Providence, RI—for 5 hours of work. This included a 30-minute pre-visit phone interview, a 1-hour orientation, 2-hours looking at art, 1-hour discussion and critique, and a final 30-minute post-visit phone interview. 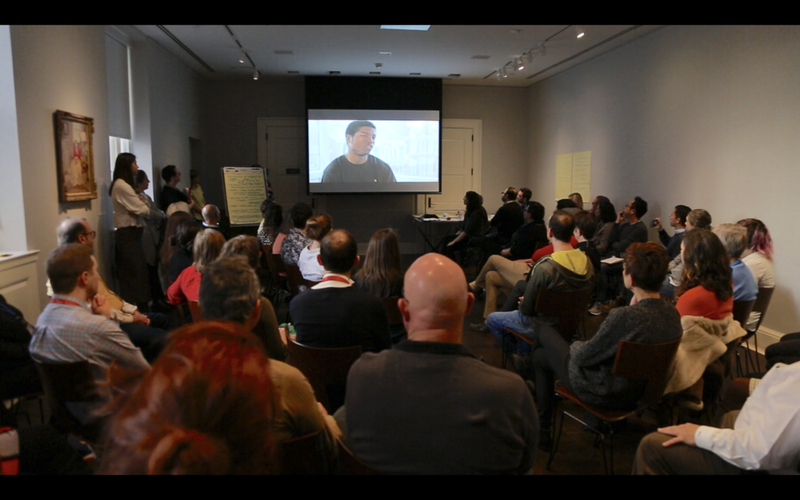 We presented the feedback of the guest critics at an all-staff dialogue at the RISD Museum. We showed a video featuring the guest critics, followed by a conversation amongst museum staff. Staff have reported that LAAGP has renewed urgency and galvanized equity initiatives. Learn more about the impact here. We’re presenting this work at conferences and writing about it as well. We’ve presented at Open Engagement, Visitor Studies Association, The Inclusive Museum, and the National Art Education Association. See what else we’re up to here. We’re now commissioning artists in Providence to realize art interventions at the RISD Museum. The artworks will engage the ideas of our critics and will be advised by a paid LAAGP critic from our pilot and will debut in June 2019. Image: Mock-up for a forthcoming intervention into the RISD Museum’s signage.